Labels Are For Clothes continues to fight stereotypes. Today, River Island launched a new ad campaign with a refreshingly diverse lineup of models. 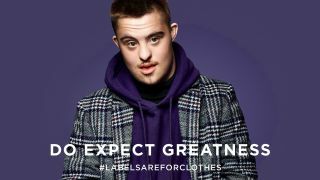 It's part of the high street fashion brand's Labels Are For Clothes initiative, which aims to do away with fashion stereotypes and champion inclusivity. This particular campaign places particular focus on dispelling stereotypes associated with disability. Labels Are For Clothes launched earlier in the year to an overwhelmingly positive response, with a SS18 campaign garnering the brand over 56 million earned impressions and tens of thousands of comments. However, one criticism fired at the campaign was that disabled people weren't represented – something River Island has righted in its AW18 instalment, which includes a 50/50 mixed ability cast. The ads are a far cry from the typical cookie-cutter campaigns gracing shopfronts and billboards. "Our mixed ability cast challenge the preconceived notions and labels applied to those with visible physical conditions and celebrate their potential, their personality and their beauty," comments Alistair Green, CSO at Studio Blvd. Integrated creative agency Studio Blvd created the campaign as part of a long-running partnership with River Island. The adverts star models with a range of disabilities, including Paralympian athlete Jordan Luce, who suffers from a condition that means he has to use a wheelchair daily, alongside Down Syndrome models Kathleen Humberstone and Harry Britton, blogger and motivational speaker Mama Cox, who lost her right leg to cancer, and dermatology student Ralph Souffrant, who has hyperpigmentation. River Island has also partnered with anti-bullying charity Ditch The Label to offer a selection of T-shirts and sweatshirts featuring the Labels Are for Clothes slogan. While the initiative is undoubtedly a step in the right direction for advertising, we're excited for a time when this kind of diversity becomes the norm, rather than the hook for a campaign.